(1) TASTING SESSION. James Davis Nicoll feeds his test subjects “Ugly Chickens” by Howard Waldrop at Young People Read Old SFF. With so many works to choose from, which of Waldrop’s stories to pick? “The Ugly Chickens” seemed like a safe bet; the setting is comfortably mundane and it won both the Nebula and World Fantasy Award, as well as garnering nominations for the Hugo, the Locus and the Balrog. I’ve been wrong before; what did the Young People actually think? I’m not generally a fan of this style of story anyway, but it didn’t matter because I was pretty much done by the third paragraph. (2) HOME COOKING. Aaron Pound has launched the “The Ad Astra Cooking Project” at Dreaming About Other Worlds. I recently acquired Ad Astra: The 50th Anniversary SFWA Cookbook, a collection of recipes from members of the Science Fiction Writers of America edited by Cat Rambo and Fran Wilde. As with all things, I intend to review it, but reviewing a cookbook poses a challenge that most other books do not: There is really no way to accurately review the book based upon reading it. Cookbooks are interactive – you can only appreciate them if you cook the recipes and eat them. So that is exactly what I am going to do…. The book was created to raise funds for the SFWA Legal Fund to support writers in need. The overall theme of the recipes in the book is supposed to be “party”, working on the theory that writers know how to throw a party. A lot of the recipes were solicited for this work, but some were originally collected by Astrid and Greg Bear for a cookbook that was never published. The introductory material includes Connie Willis passing on some excellent cooking advice from Charles Brown, and Carrie Vaughn explaining how to create a cocktail laboratory, including a couple of recipes for some classic cocktails to try. Larry Niven contributes a chapter on how to serve hundreds of cups of Irish Coffee to eager convention-attendees, an essay that is clearly informed by lots of experience…. First out of the oven is — “Ajvar by K.V. Johansen”. The first recipe in Ad Astra: The 50th Anniversary SFWA Cookbook is one that K.V. Johansen discovered when some of her books were translated into Macedonian and she began traveling to the Republic of Macedonia, presumably to promote her work. Ajvar is an eggplant and bell pepper concoction flavored with garlic, cider vinegar or lemon juice, and hot sauce that can be served as a spread on naan or bread…. The premise: More surreal comedy about characters patterned on famous composers using musical powers to bend reality. And Antonín Dvo?ák will be a pygmy hippopotamus. The buzz: The first ClassicaLoid was a surprise hit in Japan, but there’s less enthusiasm about it in English-speaking fandom. (4) ALL FALL. Meanwhile, back on American TV — “Your Guide To (The Many, Many) Sci-Fi And Fantasy TV Premieres And Returns In October” from Creators. The Fall season launched in September with over a dozen returns and premieres, but things really kick into gear in October. At current count there are 23 (!) shows returning to the schedule or starting their freshman seasons this month, and that means you have quite a lot of #scifi and #fantasy shows to pick from. Below is a rundown of the October entries and you can see the full Fall schedule here. (5) CLASSIC SF BOUND FOR TV. Deadline has a blast of genre news: “Amazon Developing ‘Ringworld’, ‘Lazarus’ & ‘Snow Crash’ In Genre Series Push”. Amazon has set up three high-profile drama series for development: Ringworld, based on Larry Niven’s classic science fiction book; Lazarus, based on the comic book by Greg Rucka (Jessica Jones); and Snow Crash, based on Neal Stephenson’s cult novel. The streaming platform has been ramping up its slate with new projects as part of a programming strategy overhaul in search of big, buzzy shows. A major emphasis has been put on fast-tracking big-scope genre drama series in the mold of Game of Thrones and The Walking Dead, with Sharon Tal, brought in earlier this year as Head Of Event Series, tasked with spearheading efforts. The deals for Ringworld, Lazarus and Snow Crash are part of that push…. More discussion at the link. (6) EATING THE FANTASTIC. Scott Edelman beckons his audience to “Ruminate over reindeer with Johanna Sinisalo in Episode 48 of Eating the Fantastic“. Joining me this episode was Johanna Sinisalo, who was one of this year’s Worldcon Guests of Honor. Her first novel, Ennen päivänlaskua ei voi (Not Before Sundown) won the Finlandia Prize for Literature in 2000 and the James Tiptree Jr. Memorial award in 2004. Her novel Enkelten vert (Blood of Angels) won the English PEN Award. She was a Nebula Award nominee in 2009 for “Baby Doll.” Her novel Auringon ydin (The Core of the Sun) recently won the 2017 Prometheus Award for Best Novel. 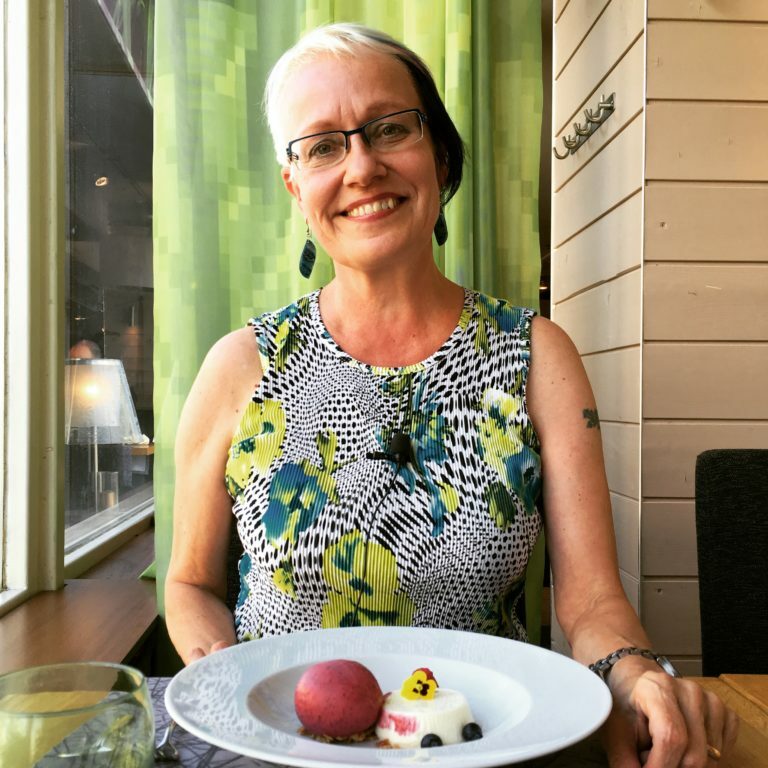 She has won the Atorox award for the best Finnish-language SF short story seven times. We discussed what she learned in advertising that helped her be a better writer, how Moomins helped set her on the path to becoming a creator, why she held off attempting a novel until she had dozens of short stories published, the reason the Donald Duck comics of Carl Barks were some of her greatest inspirations, the circuitous way being an actor eventually led to her writing the science fiction film Iron Sky, and more. (7) KINGS GO FORTH. Daniel Dern says, “This NPR segment gives a good sense of what the King father/son event I went to was like – some of the readings and the schmoozing, including many of the same points and anecdotes I heard them do in person. (hardly surprisingly).” — “Stephen And Owen King On The Horror Of A World Without Women In ‘Sleeping Beauties’, Author interview by Mary Louise Kelly”, initially on NPR’s Morning Edition. (8) CAVEAT EMPTOR. These are supposed to be Top 10 Facts You Didn’t Know About Star Trek Discovery. If it turns out you knew them, I don’t know where you go for a refund. Chip Hitchcock and John King Tarpinian send this warning about a peril for Filers, in yesterday’s Bizarro. (10) SAFETY FIRST. John Scalzi’s question elicits a thread of entertaining answers…. (11) HAPPY ANNIVERSARY, WESLEY. Teresa Jusino is giving orders at The Mary Sue: “Star Trek: TNG at 30: Here’s Why Wesley Crusher Was Awesome, So You Just Shut Up.”. Basically, the moral of so many episodes of TNG was basically Hey adults! Maybe if you’d listen to Wesley instead of telling him to shut up all the time, you might learn something! In “The Naked Now,” the entire Enterprise crew is infected with a Polywater intoxication that makes everyone all primal and horny and totally into their own deepest desires. So, naturally, what’s the oft-ignored Wesley’s deepest desire? (Besides Ashley Judd?) That’s right, he makes himself the Acting Captain of the ship thanks to a doohickey that he made for fun that can replicate Captain Picard’s voice. And yet, even while under the influence, he’s such a genius that he’s able to figure out how to quickly turn the ship’s tractor beam into a repulsor beam when the adult Chief of Engineering tells him it would be too hard. He uses the repulsor beam to propel the disabled Enterprise away from another ship, narrowly avoiding the fragments of an exploding star that would’ve hit them. This is the kind of thing Wesley Crusher was capable of on a bad day…. (12) THE MONEY KEEPS ROLLING IN. Vox Day’s crowdfunded Alt*Hero raised $37,000 of its $25,000 goal in about a day. Three donations account for $10,000 of the receipts, however, the site reports 426 backers so far. A new alternative comic series intended to challenge and eventually replace the SJW-converged comics of DC and Marvel. It’s the end of an Avengers Era as we know it! 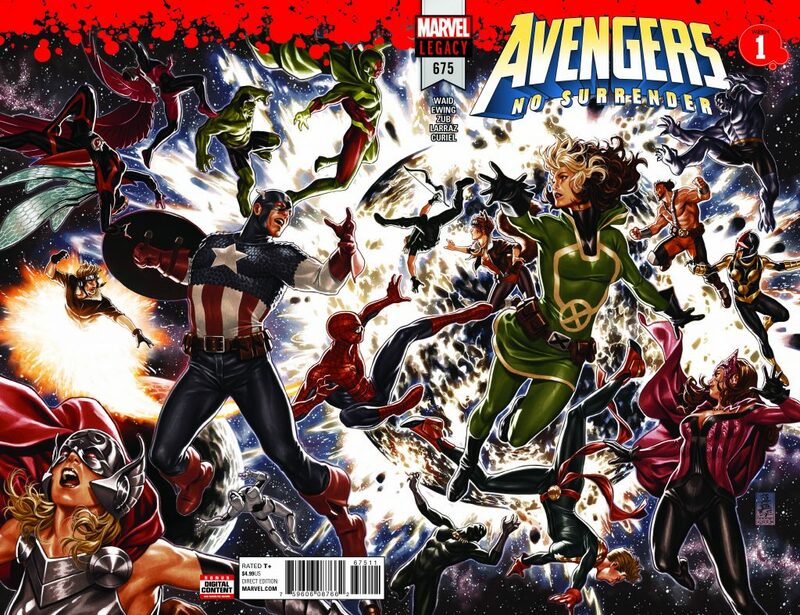 And in the team’s final days, a change has come to the Marvel Universe in the form of a story that’s filled with so much action and so much drama, Marvel had no choice but to make it a weekly epic! Beginning this January, Marvel will unleash the epic AVENGERS: NO SURRENDER with AVENGERS #675, a weekly saga that unites the casts and creative teams of three titles into an epic tale of heroic action, jaw-dropping cliffhangers, and drastic adventures! The AVENGERS, UNCANNY AVENGERS and U.S. AVENGERS come together in a powerhouse of an event that will be unleashed in a story as spectacular and epic as the Marvel Universe itself. Featuring one of Marvel’s biggest collaborations to date, each issue will be co-written by superstar writers Mark Waid, Al Ewing and Jim Zub with art by Pepe Larraz for the first month, Kim Jacinto for the second month, and Paco Medina for the third month. (14) REMINDS ME OF HEINLEIN. More dreams: “Elon Musk says rockets will fly people from city to city in minutes”. Mr Musk made the promise at the International Astronautical Congress (IAC) in Adelaide, Australia. A promotional video says the London-New York journey would take 29 minutes. Mr Musk told the audience he aimed to start sending people to Mars in 2024. His SpaceX company would begin building the necessary ships to support the mission next year. He says he is refocusing SpaceX to work on just one type of vehicle – known as the BFR – which could do all of the firm’s current work and interplanetary travel. (15) SURF’S UP. The BBC reports a journal article: “Tsunami drives species ‘army’ across Pacific to US coast”. Scientists have detected hundreds of Japanese marine species on US coasts, swept across the Pacific by the deadly 2011 tsunami. Mussels, starfish and dozens of other creatures great and small travelled across the waters, often on pieces of plastic debris. Researchers were surprised that so many survived the long crossing, with new species still washing up in 2017. (16) GENE FIXING. Beyond CRISPR: “DNA surgery on embryos removes disease”. Precise “chemical surgery” has been performed on human embryos to remove disease in a world first, Chinese researchers have told the BBC. The team at Sun Yat-sen University used a technique called base editing to correct a single error out of the three billion “letters” of our genetic code. (17) DANGER UXB. Neat video: “WW2 bombs blown up at sea in Japan”. US-made shells have been destroyed in a controlled underwater explosion in Japan. (18) KILLING GROUND. Real-life source of some “Call of Duty” scenery: “The deadly germ warfare island abandoned by the Soviets”. That expert was Dave Butler, who ended up going with them. “There was a lot that could have gone wrong,” he says. As a precaution, Butler put the entire team on antibiotics, starting the week before. As a matter of necessity, they wore gas masks with hi-tech air filters, thick rubber boots and full white forensic-style suits, from the moment they arrived. They weren’t being paranoid. Aerial photographs taken by the CIA in 1962 revealed that while other islands had piers and fish-packing huts, this one had a rifle range, barracks and parade ground. But that wasn’t even the half of it. There were also research buildings, animal pens and an open-air testing site. The island had been turned into a military base of the most dangerous kind: it was a bioweapons testing facility. 9 days left to go in the campaign, and we’ve reached another stretch goal to add 3 novellas which adds another 58,000 words to the book! All 3 excellent science fiction stories by S.B. Divya, Mary Robinette Kowal, and Gu Shi with translation by Ken Liu and S. Qiouyi Lu. I’ve also added a reward level that includes a print and ebook copy of each of the 3 volumes of the anthology for $80–if you’ve already pledged but you’d like print copies of all 3 you can choose to upgrade. There are still a couple of stretch goals left. The next one’s just a short hop of $58 from where we are now to add “We Have a Cultural Difference, Can I Taste You” by Rebecca Ann Jordan. And another $300 beyond that to add one more novella “Hammers on Bone” by Cassandra Khaw. This entry was posted in Pixel Scroll and tagged Aaron Pound, anime, Avengers, Daniel Dern, David Steffen, James Davis Nicoll, Johanna Sinisalo, John Scalzi, Marvel, Owen King, Petrea Mitchell, Scott Edelman, Star Trek, Star Trek: Discovery, Stephen King, Vox Day, Wil Wheaton, Young People Read Old SF by Mike Glyer. Bookmark the permalink. So, 15 year old book, signed, and the author is dead. It’s possible that a copy might be found in the dealers room at World Fantasy or World Horror. Or perhaps DreamHaven Books. FWIW, pretty sure all of the Midnight House runs were this small.